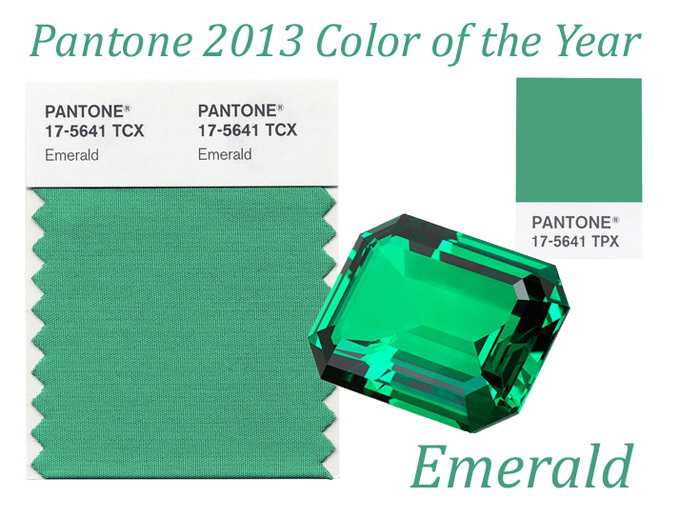 Pantone made their official announcement late last year that Emerald was the color of 2013. You may remember that last year it was tangerine tango, a reddish orange shade that promised to be the perfect energy boost to any wardrobe. This year's selection of emerald is full of life. Pantone calls it a "lively, radiant, lush green." Green is certainly a color that signifies life and growth. I think of plants, nature and spring. Leatrice Eiseman, executive director of the Pantone Color Institute said, "The most abundant hue in nature, the human eye sees more green than any other color in the spectrum....Symbolically, Emerald brings a sense of clarity, renewal and rejuvenation, which is so important in today's complex world." You're going to see this color in everything from fashion to cosmetics and interiors. It's a great color that balances out everything.